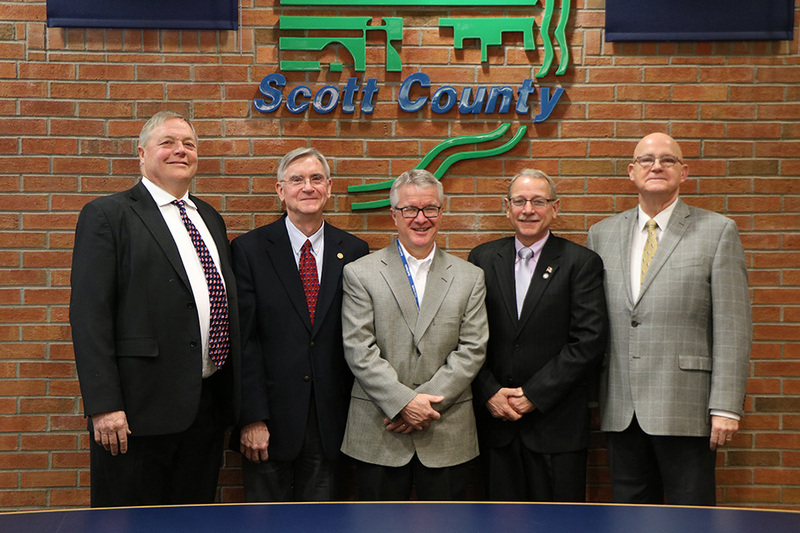 The Board of Supervisors meets bi-weekly in the Board Room of the Scott County Administrative Center. Committee of the Whole Meetings are held on every other Tuesday at 8:00 a.m. and regular Board meetings are held the following Thursday evenings at 5:00 p.m.
Scott County is governed and administered by a five member Board of Supervisors. The Board of Supervisors are elected in staggered, four year terms on a partisan basis. County Home Rule, which was approved in a State-wide referendum in 1978, broadened the power of the Board of Supervisors. Home Rule allows counties to determine their local affairs and government provided that it is consistent with and not expressly prohibited by the Iowa General Assembly. The Board of Supervisors serves as the administrative and policy-making body for the county. approve zoning changes and plats for new subdivisions. In addition, the Board is considered to be the employer of all county employees and is therefore required to bargain with employees over wages, hours, and working conditions. Chair appointments of Supervisors to the 2019 Board and Commissions can be found HERE.